This is a special recipe from Moomie, a great friend on King Arthur Flour's "Baking Circle" message board. I found this a few years ago in a King Arthur Flour Company catalog and had to try them. Haven't tried another one since. Our family loves these and they are so easy to make them the specific size you need and get the most delicious buns! Make these in your bread machine as Moomie does, or by hand as I do. The key to success is to remember that soft rolls require soft dough. 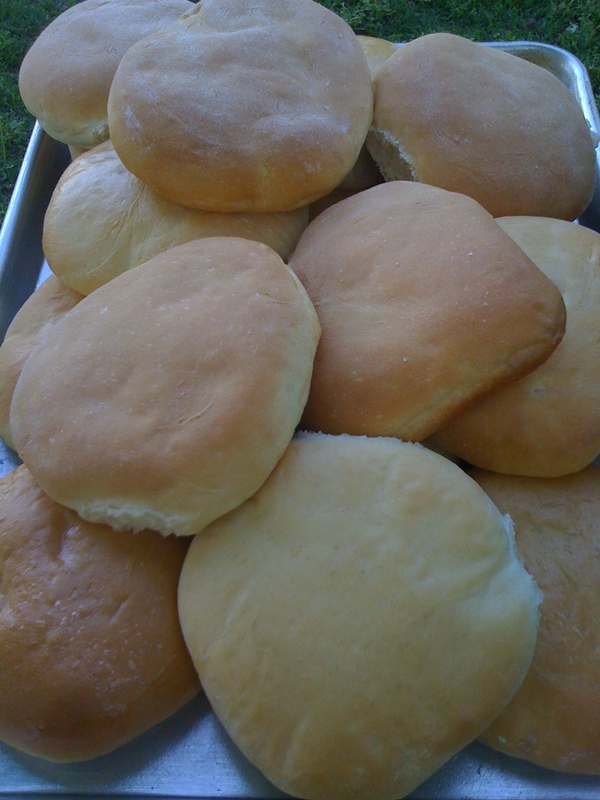 It's easy to double, makes a great bun for any type sandwich, and you can even make them into hot dog buns if you want! In a large bowl, mix yeast and warm water. Let set for 5 minutes. Mix the sugar and salt, add to the yeast mixture. Gradually add flour to liquid mixture, one cupful at a time. To tell you the truth, I don't actually know how much flour I use, but just add it until it feels right in my hands (not real helpful I know). Turn the dough onto a floured surface and knead until smooth and supple. Put back into bowl and let rise until it has doubled in size. I put a dishtowel over the bowl to keep any drafts off the rising bread. Once it has doubled in size, dump the dough onto a lightly floured surface. Divide into 8 pieces. 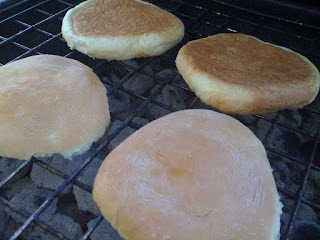 I shape them into a "bun shape" and place them on a greased cookie sheet. I spray them with Pam or olive oil. Let them rise about 30-40 minutes or until they are the size you need. You can cover them with the dish towel again. If it is a really warm day, you may not need to let them rise the full 30-40 minutes. Bake in a preheated 375º oven for 12-15 minutes until golden brown. Cool on wire racks. You can add a teaspoon of onion powder or 1/2 tsp. dried onion to the dough. Slice in half. I love to spread a little butter on mine and either put them on the grill or toast them in a skillet. An awesome and easy bun recipe. Sometimes I add a bit of wheat, but this will make them a tad bit heavier and longer to rise. I hope you'll give these buns a try!